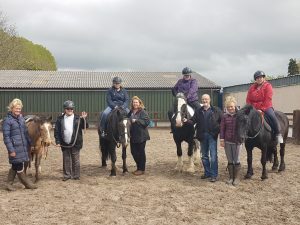 Happy Hooves Riding Centre near Penrith specialises in horse riding and interaction activities specifically for people with disabilities, long term health problems or mental health issues, children with behavioural issues, and families in crisis. The British Horse Society (BHS) approved centre receives referrals from charitable organisations such as Carlisle Mencap, children’s hospice, Jigsaw, the Calvert Trust, day care centres and Cumbria County Council. The social enterprise received £2,000 from the Edmond Castle Education Trust to provide subsidised riding lessons for people with disabilities as horses are becoming better known as therapeutic animals, helping people with a variety of physical and emotional issues. The centre has been awarded Accessibility Mark accreditation aimed at providing more opportunities for disabled riders to get involved in sport and activities, approved by the Riding for Disabled Association (RDA). The centre will be expanding their courses to offer RDA approved qualifications, awarded to individual for their achievements.